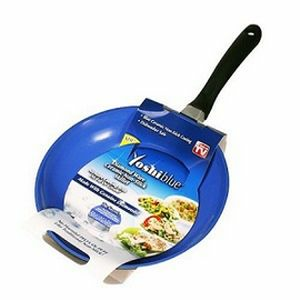 This As Seen on TV Yoshi Blue Skillet makes cooking a lot more fun and easy. The Yoshi Blue Skillet does not get scratched, so it always looks new. The Ceramic Skillet is made from pulverized diamonds and nano-ceramic, so food won't stick. This Yoshi Blue Skillet wipes clean with ease, so cleanup is fast and easy, regardless of what you cook!